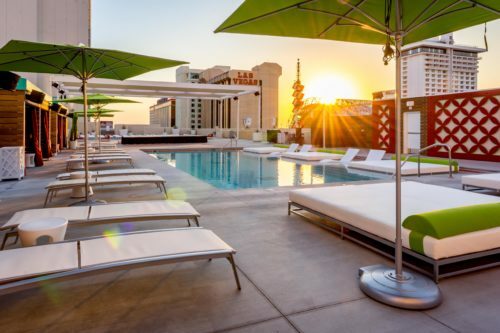 Guests enjoy a rooftop pool experience unlike any other in Downtown Las Vegas, with fresh décor, private cabanas, a hot tub, Pickleball courts and an onsite food truck. LAS VEGAS, VN — After a multimillion dollar renovation adding brand new resort-style furnishings, a wet deck, hot tub, refurbished outdoor recreation space and its own food truck, the rooftop Pool at the Plaza celebrated its grand opening with festivities for hotel guests and the general public on Saturday, July 2 at the Plaza Hotel & Casino. The entire renovated pool deck encompasses approximately 70,000 sq. ft., making it one of the largest in downtown Las Vegas. 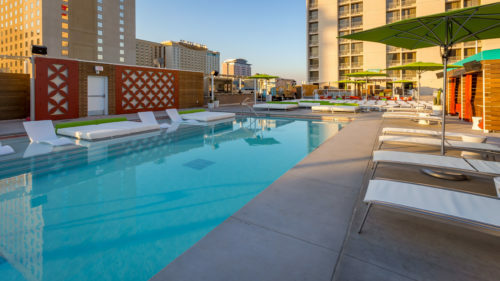 Creating a rooftop pool experience unlike any other in downtown Las Vegas, the Pool at the Plaza is a “retro Palm Springs-meets classic downtown Las Vegas” inspired outdoor space. The renovations refurbished and redesigned the pool to include a wet deck with several lily pad daybeds. The Plaza also added a 12-person hot tub, new chaise lounge chairs, greenery, gaming, and multiple dining areas with a new bar and several food options, including the pool’s own food truck. Six brand new cabana suites available for rental provide guests with a private poolside retreat, complete with televisions, fans, refrigerators and safes as well as a complimentary fruit plate and cheese and cracker tray. The renovations also refurbished adjacent tennis and basketball courts and added dedicated Pickleball courts, making the Plaza the only hotel/casino in Las Vegas with dedicated courts for this fast growing sport. With space for a stage, the Plaza plans to offer a lineup of live entertainment to include weekend DJs, concerts and special events. Guests can relax with a refreshing cocktail poolside or at the walk up bar. And no one will go hungry as the Pool at the Plaza offer food service from Pop Up Pizza and Zaba’s Mexican Grill located onsite or from the pool’s own food truck. Headed by Shawn Giordano, the food truck will offer a unique menu of seaside street food inspired by classic California cuisine, such as ahi tuna poke lettuce wraps, crispy rice paper tacos and lobster rolls. Giordano comes to the Plaza with decades of culinary experience, beginning his career over 20 years ago working for Wolfgang Puck opening Spago in Beverly Hills and Trattoria del Lupo at the Mandalay Bay Resort & Casino then as private chef to famed photographer, Annie Leibovitz, and most recently, heading up the kitchen at downtown Las Vegas eatery PublicUs. Admission to the pool is free for hotel guests and residents (with local identification), of all ages. Reservations of the tennis, basketball and Pickleball courts and all necessary equipment is available for a nominal charge per person.